This blog refers to the current document and its controversial rebuttals by Oncologists and Public Health Figures in Australia. Released In Melbourne this week. I have tried to place this into the context of my life as a busy Family Physician or General Practitioner depending on which part of the world you reside in. As GP’s we have a different context to our medicine and are mindful that guidelines for Specialists are not necessarily applicable to Family Practitioners. When they disagree it drives me crazy!! Thank you to the Urological society for this important document and the subsequent and necessary debate. I am a General Practitioner so I am not under the auspices of your college, nor the college of Oncologists. Before I start and maybe it’s a bit controversial but referring to a Fellow College or practitioner as a Pig Farmer or being “like a Pig Farmer” is frankly demeaning to the profession and to this debate. We all have cognitive biases. I would plead with both sides of this important debate to recognise that what we all want here is an effective strategy for the benefit of the patient with the least amount of harms, both to that individual patient and to the population who ultimately pays the fiscal price. Respectively to get the best voices to this debate, a more respectful thoughtful discussion might encourage other quieter voices that may have much to add. I plead with you to stop it. There I said it. So that was the easy controversy. Our College has as its guideline for best practice on Prostate management a simple strategy: that is “not to ask the patient regarding screening” and to discuss only in the context of a patient led enquiry. The College has worked hard with a volunteer committee of Committed Drs examining evidence to come up with the best solution for Australia’s General Practitioners. Whilst I acknowledge this very hard and excellent work I feel frustrated by its implications. I recognise that a universal screening program for PSA testing in Australian men over 50 has cost limitations. The limitations include cost of the testing, lives saved, morbidity and mortality of the investigation of positive tests. First do no harm is a worthy consideration amongst all the other players in this arena. However it does feel rather an issue. The stats are from the Cancer Council Australia’s page. Prostate Cancer is the leading cancer diagnosed in Australia and accounts for 7.4% of all Cancer deaths. Bowel is number 2 and accounts for 10.4% of all Cancer deaths; Breast is number 3 and accounts for 6.8% of all Cancer deaths in Australia. So Prostate Cancer is an important Cancer, and it is being diagnosed it seems relatively well. There is no age stratification on those figures and no attempt to calculate number of years of life lost. Someone dying at 89 years of age from prostate cancer is not the same as someone dying at 49 years of age from bowel cancer without diminishing the loss to both individuals and their families of course. My issue remains with this common cancer, is it ethical for me to withhold this discussion from a man even if he doesn’t bring it up? I don’t screen for Pancreatic Cancer and I don’t screen for Brain Tumours or Lung Cancers. Lung Cancer is the 5th most common cancer by diagnosis and yet accounts for 19.1% of all cancer deaths. The other ethical issue I have is that I treat individuals, not populations and I am not an economist. I steadfastly refuse to bring economics into the ethics of treating a single individual patient’s predicament. I have seen public and private patients treated differently within the medical community and I find that pretty horrid. I am pretty sure that not everyone agrees with that, having a more pragmatic attitude towards the use of finite health resources and it goes somewhat towards the whole world health stance currently on the necessary politics of health care rationing. As I said, I am a Family Physician, I treat individuals and I treat them in their community context. That is all. Take the economics of health care to the electorate. I would think most General Practitioners, Family Physicians are aware that the Free PSA with a DRE is not a good screening tool on its own. It doesn’t tell us which are the rabbits and which are the tortoises. We know that. But is the presence of a tortoise therefore the determinant that we don’t look for the rabbits? Again ethics here. To a man of 50 he may wish to make that informed decision himself. A man of 90 may elect otherwise. Context driven. And now for some Animal metaphors: noting the absence of any Piggery. My issue with the RACGP guidelines is that men do not volunteer very much in any consultation from central crushing chest pain (reluctantly) and most unlikely some LUTS, urinary incontinence, nocturia, diminished urinary stream, frequency etc. In the same way there are probably more men withholding a history of erectile difficulties than there are volunteering them to their Doctor. As a GP I feel really uncomfortable not having this long involved and important discussion with men. 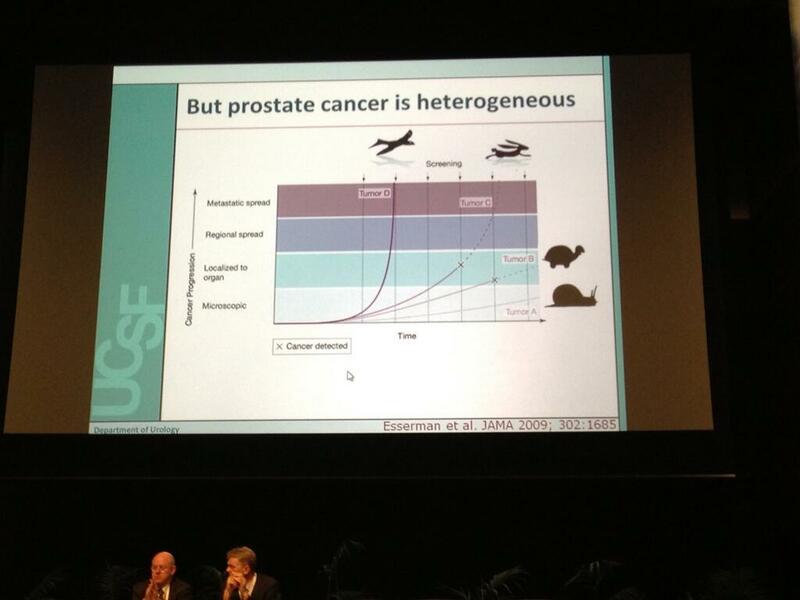 Do I have to wait until the prostate cancer has presented with metastases before I have this discussion? My non medical partner says most men now he encounters are extremely confused about this debate and isn’t it our job to inform them? Or will the lay press once again take control of this discussion or others with vested interests? In General Practice when we assess someone for CVS risk as I pointed out on Twitter we do not rely on cholesterol alone. A decision aid is extremely useful. Online ones are better for me than a piece of tree which I invariably have difficulty finding. This link below is more in keeping and concordant with the RACGP guidelines that unless you have a family history or Lower Urinary Tract symptoms you may not need a PSA. Which after all is really what the “don’t ask” statement is all about, but as I pointed out men are notoriously difficult (!) and taciturn historians when it comes to their health. Men of interest in the 50-69 age groups we do not see often enough in General Practice. So for me opportunity to inform and educate is important. I don’t neglect to tell them about exercise, weight management and diet either when I take their blood pressure. It may well be that a lot of men do not go on to have the PSA test after this discussion but at least they have had it and remain aware of what a Lower Urinary Symptom might be and might mean. Consensus Statement 1: For men aged 50–69, level 1 evidence demonstrates that PSA testing reduces prostate cancer-specific mortality and the incidence of metastatic prostate cancer. Well for me it will be after the aforementioned discussion and link or maybe I will find that piece of paper decision aid. Consensus Statement 3: PSA testing should not be considered on its own, but rather as part of a multivariable approach to early prostate cancer detection. Ok so DRE, family history, prostate volume and ethnicity with future research working hard here to develop better biomarkers and imaging strategies. Risk stratification is more difficult and one in which the Urologist plays a part in association with the General Practitioner. This may occur after a PSA, either a baseline one at 40 as per the Urological Society suggests or after a discussion on the risks and benefits false positives and false negatives of the PSA test, and DRE. Consensus Statement 4: Baseline PSA testing for men in their 40s is useful for predicting the future risk of prostate cancer. I would like to see more informed discussion on the algorithm for a 40 year old PSA to stratify men who may not ever need a PSA in the absence of any other risk factors. That would be nice. As a GP I am still considering my response on this Statement. I am interested to hear more if it indicates I can save a man any further need for PSA. Otherwise I am less comfortable with this recommendation at this stage. Can I say I am still feeling my way on this one? Consensus Statement 5: Older men in good health with over ten year life expectancy should not be denied PSA testing on the basis of their age. There is a similar discussion around breast cancer screening and the ethics of ageist screening. To the individual involved who is still leading an active life, a discussion on the monetary value of their life to the community seems rather out of place in my consulting room. Intervention is now in the province of the Urologist as I as a GP, have tried to explain the diagnostic process and its complexity as it presents to me every day. This discussion is made all the worse for General Practitioners and patients by disagreements between the various colleges. I believe Prof Bruce Armstrong and Prof Ian Haines discuss the issue they have regarding the costs including prostatic biopsy complications, anxiety, monetary costs to the community, loss of life years to an older man, incontinence and impotence. They are not wrong to raise these important issues. It is heartbreaking to hear a middle aged woman cry about the loss of intimacy in her marriage due to prostate cancer treatment and the inability of her partner to even discuss this with her. This is truly a very sad circumstance especially after all the kids have often just left home! I do think as clinicians we are working towards the same end. That middle aged woman above should neither be in great distress about the loss of intimacy in her relationship but neither should she be crying about the recent diagnosis of bony metastases in her partner. I would like to thank the RACGP for attempting to steer Australia’s General practitioners with an evidence based guideline. As it is a guideline I have added here my own personal take on its use. I would like to thank the dissenters Prof Bruce Armstrong and Prof Ian Haines for necessary if at times, contentious caveats. We are trying to predict the future after all and like breast cancer diagnosis, cardiovascular risk profiling it takes time to sort out the best way forward. We only have the technology that is available today and I salute the researchers who are working towards better diagnostic, better investigation and better treatment tools. As a General Practitioner I have to individualise treatment in a socio-cultural context and in my own context of understanding and tolerance of risk or uncertainty. I felt compelled to write this and I hope it is coherent as it is vital that specialists understand that General Practitioners work in a different context. We may be also stratifying cardiovascular risk and weight management along with a skin check in the same consultation. We have to place the myriads of excellent discussion into the individual assessment of any single patient and bear the consequences of getting it right or wrong, or as it is at the moment, to be sure of neither. We remain uncertain about whether we indeed first do no harm. I welcome discussion on the merits or otherwise of the blog post however references to Pig Farmers or other literary equivalents have no place in a scientific discussion of an important medical topic which requires both art and science to deliver in a coherent state to an anxious or not so anxious male population and the similarly afflicted Family Physician.